North 61 is a Voyageur Sponsor of Pedal to DC. The North Shore has inspired many of us to get outside, to explore, to try new adventures. To the family behind North 61, the area inspired the creation of their own company. Founded in 2017, North 61 (named for the scenic drive in Minnesota) is a conscientious, family-operated company selling American made and upcycled adventure gear. From clothing and gifts to bison leather bags, they’ve always got something cool to check out. We’ve been lucky to have the support of North 61 for a while now. You may have seen their 1982 VW Westphalia pop-up at our Broken Clock Brewery festival or other events. You’ll definitely catch a glimpse of their logo on Dave and Amy Freeman’s bike helmets if you spot the Pedal to DC ride by. 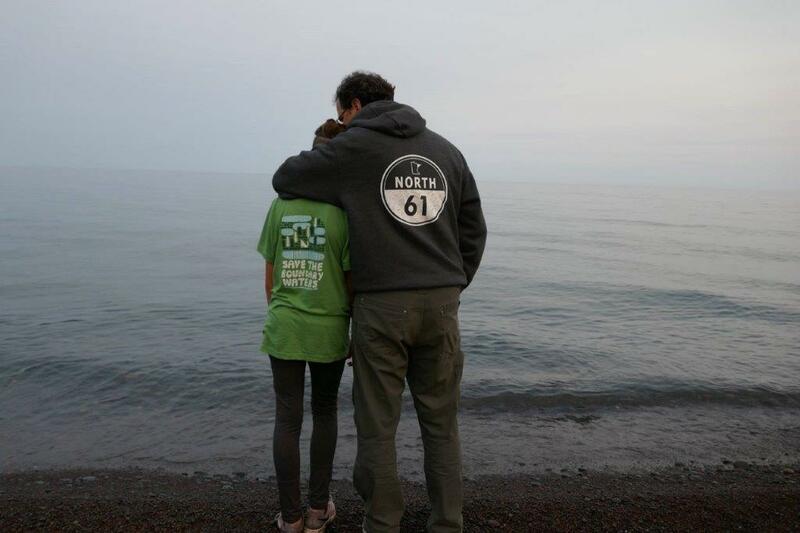 This weekend (May 18 through 20, 2018), North 61 will donate 25% of all net sale proceeds to the Campaign to Save the Boundary Waters! Shop here. There has been another attack on America’s most visited Wilderness. The U.S. Department of the Interior recently took another step to allow sulfide-ore copper mining on public lands next to the Boundary Waters: a decision that reinstates two expired mineral leases to the Chilean-owned mining company, Twin Metals Minnesota. How did this happen and what does it all mean for you and our public lands? Read the Q&A below to find out. Q: Wait. What just happened? A: On May 2, 2018, the Department of the Interior and its agency the Bureau of Land Management (BLM) issued a decision that reinstated two expired mineral leases for the benefit of Twin Metals Minnesota, owned by Chilean mining giant Antofagasta. These leases give Twin Metals possession and control of approximately 5,000 acres of Superior National Forest lands for the end-purpose of mining. These mining activities include exploratory drilling, hydrogeological drilling, road building, construction of mining facilities, and the extraction of minerals for the profit of Antofagasta. Q: What areas are these leases for? A: One lease is immediately adjacent to the Boundary Waters near the Gabbro Lake area and the second lease is a few miles away. Both leases are along the South Kawishiwi River. One lease includes lands along Birch Lake. Q: Why did they do this? A: In 2016, the U.S. Forest Service declined to consent to the renewal of these leases because of the risk of harm to the Boundary Waters and the Superior National Forest. Twin Metals challenged the denial of its requests to renew old mining leases. Twin Metals claimed that it ‘owned’ the public’s minerals because it held two expired mining leases and therefore neither the Forest Service nor the BLM could deny it new leases. In a new legal opinion issued on December 22, 2017, the Department of Interior’s legal department reversed course and determined that original mining leases issued in 1966 gave the mining company mandatory rights to renew the leases, even though the area had never been developed into a mine. Q: Does this mean Twin Metals will start mining? A: No. The May 2, 2018 decision reinstated two expired leases and two applications to renew these leases. The next step for the BLM and the Forest Service is to process applications to renew the leases. This will likely include a limited environmental review of the impact of sulfide-ore copper mining on the environment. If the leases are renewed, Twin Metals says it intends to design a mine and a plan of operations and then begin applying for the many permits and approvals necessary for mining. Q: What about the two-year study by the Forest Service on its proposal for a 20-year mining ban? A: In January 2017 the Forest Service submitted an application to the BLM for a 20-year ban on mining on 234,328 acres of Superior National Forest lands in the watershed of the Boundary Waters. The BLM accepted the application and imposed a two-year moratorium on any new mining decisions while the Forest Service conducted a study of the environmental, economic, and social impacts of the ban. The study is expected to be concluded by January 2019. Q: What areas are covered in the study by the Forest Service? A: The area covered by the study for the 20-year ban includes the 5,000 acres covered by the two expired mineral leases that were reinstated. After the study is completed, the Secretary of Interior will make a decision on the Forest Service’s application for a 20-year ban. Q: What can we do to stop this? A: The Campaign to Save the Boundary Waters will challenge this decision in court. However, we need you to demand that our elected officials take a strong stand against this order and ask that it be reversed. The public must express, in strong terms, its disapproval of the decision and copper mining near the Boundary Waters to elected officials and the land management agencies. 15 miles northeast of Ely, by way of the Echo Trail, lies South Hegman Lake—entry point 77 into the Boundary Waters. Together with North Hegman Lake, the combined Hegman Lake experience offers much in the way of wintertime activity. What is especially unique about this parcel is the presence of a pictograph site on the northern lake. Native American occupations of this area extend as far back as 9,000 years, and the pictographs have been dated to have been made within the last 500 to 1,000 years. Although half of the images are too abstract to be accurately interpreted, a handful of these historical remnants depict tools, human figures, mythological creatures, animals such as moose and birds, and human hand prints. Nearly all of them are painted in a red ochre, bound in bear-grease or fish eggs. This site is one of 30 or so pictograph treasures hidden throughout the Boundary Waters. They’re a spectacular day-trip in the winter by snowshoe or cross-country ski, and a worthy stop on any canoe outing. You can find them (if you dare) on a granite cliff-face in a narrows area between North Hegman and Trease Lake—the exact location, we leave to you explorers out there. Have you seen any of the other pictographs in the Boundary Waters? First of all, thank you to everyone who submitted a story for the Wall for Wilderness. We have so enjoyed reading back through well over 100 stories submitted by you all, our fellow BWCA lovers. Memorable tales of moose and bear encounters, close calls with fires, moments of deep and uninterrupted silence, stories of love and of loss, blueberries and backcountry cooking all made it into the mix. A few of these stories really stood out to us and we wanted to share them with everyone. Pour yourself another cup of coffee and enjoy! I sat in my tent as still as I possibly could, my heart hammering in my chest. It was just a single overnight alone on Flame Lake, a tiny, single-campsite lake in the southern part of the Boundary Waters. It was late August and I hadn’t seen a moose my whole summer of working at Sawbill, a canoe outfitter on the edge of the wilderness. But now, alone as I had probably ever been, now I started to hear the dripping, the sloshing, the mucky suction as she picked her hooves up and placed them in front of her again and again, these noises getting closer and closer. I wanted so badly to peek out the window and look toward where she had to be moving around, but hardly dared to breathe, and beside that, there was only the smallest moon making it unlikely that I’d see anything anyway. It felt like both hours and only a few brief moments, but her footsteps and sloppy slurping started to move farther away, eventually only some cracking of branches as she made her way out of the water and back into the forest, and then, stillness again. I let out the breath I hadn’t realized I’d been holding. My heartbeat started to calm back down, and my lizard-survival brain fell back into neutral. Had I been absolutely scared out of my mind, alone, this enormous 800-1000 pound, poor-sighted creature, lumbering toward me? Absolutely. And at the same time, the awe that, to this day, stays lodged in my bones from this experience is incredible. Not only the moose herself, but what she represented at that moment – the power, might and awe that I have for this world that is often easy to forget about and pass by as everyday and normal. My friend Tim Gellenbeck and I were camped at the very bottom of Lake Insula and out fishing nearby on the morning of September 14, 2011. For the first time in all of our years of Boundary Water trips, a very low-flying Forest Service floatplane buzzed us and actually landed nearby and offloaded a canoe with a pair of Forest Service rangers who promptly paddled over to us and told us a forest fire was racing our way, the lake was closed and we had to get out right now! But we could not go out through the numbered lakes as we had planned (and where we were to be picked up), but instead would have to paddle all the way back up to the top of Lake Insula and find some way out that way. We raced back to our campsite, packed our gear, and started north up Insula toward Thomas. By the time we got started the smoke was already thick and we could see the fire racing up both sides of the long and narrow lake. The winds picked up, and the water was rough. At times the visibility was just a few feet due to the heavy smoke. We spent all day fighting winds, waves and smoke to get away from the fire. The Forest Service airplane periodically circled over us, but we were on our own. We later learned that several fire fighters had been forced to dig in and shelter under a fireproof blanket while the fire flashed over them, right about where we had been camped; fortunately they survived. During our long paddle that day, we did see one other group far ahead of us, but since we had been camped in the last campsite in Insula in the direction of the fire, we were fairly certain we were the last ones out of Lake Insula ahead of the fire. Tim and I made it to Thomas Lake that evening where we camped, with a birds eye view of the big yellow fire suppression aircraft that repeatedly swooped down on the water right in front of our campsite to scoop up loads of water to dump on the fire just to the south. We ended up paddling out through Ima and eventually to Snowbank, where another Forest Service ranger with a satellite phone was able to contact our outfitter, Dan Waters, to let him know where to pick us up. It was a remarkable experience that Tim and I will never forget. During a 7 day trip in the Boundary Waters, our crew stopped for our layover day on Lake Hatchet. The campsite had enough of a breeze to kept away the mosquitos, and a lovely view of the lake, perfect for sunset photos. During our lay-over, a few girls from our all female crew, went across the lake and discovered a huge patch of wild blueberries. They collected as many as the three could carry in a single gallon pail, returning from their foraging as heroines. We all had handfuls of blueberries to eat with dinner, and for dessert, we stuffed our campfire cheesecake to the brim with these small saphires. After cleaning up the campsite for the night, Lake Hatchet gave us a beautiful surprise--smooth as glass water for a beautiful sunset. In the morning, to our astonishment, we awoke to find we were seemingly on a mountain--the fog of the morning obscured the water, and make it seem like we were high above the earth. Lake Hatchet was beautiful and peaceful from the time we arrived, to the time we descended from the clouds. Every year around this time of the season, it gets especially difficult not to daydream about packing a lunch, grabbing a tackle box, and spending a summer afternoon up at Little Trout Lake in Voyageurs National Park. What Little Trout Lake lacks in size it makes up for in solitude. Reaching it requires a short hike or portage from Sand Point Lake, but the scenery is well worth the extra effort. Like many of the region’s lakes, Little Trout is a perfect spot for swimming, canoeing, and taking in the beauty of northern Minnesota’s wilderness. Visitors can also enjoy hiking along the rocky shoreline of the lake or pitching a tent to make it a memorable stop on a backcountry camping trip. Voyageurs National Park is home to over 218,000 acres of protected land and water along the Canadian border, just northwest of the Boundary Waters Canoe Area. While a majority of the Park is open and accessible to motorized watercrafts, several lakes within the Park mimic the restrictions of the BWCA. The pristine waters of northern Minnesota make places like Voyageurs an ideal destination for recreation of all sorts. So whether you’re looking to catch a lunker or camp under the stars, start planning your trip to Voyageurs National Park today! up to Northern Minnesota where the pure waters flow. To protect the wilderness where we loved to go. up near the border where God’s country lay. the Twin Metals Ore Mine has turned it all gray. and listen for the call of the eagle and loon. and a sky full of stars and the brilliant full moon. Well the ore company came and tore the earth open. They made lots of money but ignored the cost. so in the end the great treasure was lost. to float on these waters and cover the land. If people again are willing to take a bold stand. I first wrote about the Boundary Waters when I was 12. I was enamored by my first canoe trip and I wrote an essay about what wilderness meant to me. The trip left from Moose Lake outside of Ely and lasted 7 days. Here’s a snippet from that essay: “A loon shrieked from across the lake. I sat up in my sleeping bag as my head hit the side of the tent. It was a chilly morning and mist covered beautiful Hanson Lake.” The Boundary Waters was my first experience in a wilderness area, and the endless shores and waterways felt like freedom, even at a young age. I was lucky enough to do several more week-long trips during my childhood, which led me to become a guide for a season after I spent several years living out of state. From my first trips through the Boundary Waters I remember swimming in clear cold water, floating on the surface of calm golden lakes, and struggling over portages while looking out from under silver canoes. A land of rock, water, and wood. Once I became a guide, I appreciated the freedom the water trails offered. Freedom to explore dead end streams and freedom to take long portages ending at tiny lakes with only one campsite and no outlet. Freedom to hug the shoreline and take the long way around the lake. I felt content following myself on a map – a tiny line meandering across a canvas of blue and green. As a guide, I led trips for mostly middle and high school students from all over the country. One middle schooler in particular reminds me of the value of wild places like the Boundary Waters. Throughout his trip, he was very vocal about the aspects of being outdoors that did not suit him. He paddled in the bow seat of my canoe most days, so I could handle his attitude and encourage him to enjoy himself. Sometimes just having an ear to absorb the sarcasm is enough to lift spirits, at least that is what I was hoping. In particular, he did not like all the creepy crawlies that live outdoors and I had to stop him from needlessly squishing insects on multiple occasions. However, on the last morning of a 5-day trip, he found a large hairy fishing spider resting under his life jacket, which had been stored under the overturned canoe for the night. From across the campsite, I watched him exclaim in surprise and then gingerly probe the spider on to a tree with a twig. I was so touched by his actions, but I didn’t dare let him know that I saw his uncharacteristic act of mercy. Even if he didn’t readily admit it, his trip in the Boundary Waters changed his perspective. If nothing else, he realized spiders shouldn’t be squished for being spiders. As I’ve moved on from guiding canoe trips, I frequently think longingly of the crisp mornings and seas of birch trees. The Boundary Waters has been a formative force in my life and I try to keep that spark of adventure with me everywhere. Directly south of Kekekabic Lake is Wisini Lake, which may seem small on a map, but looks are deceiving with this one. This lake is mighty. Wisini Lake has one of the best kept secrets of the Boundary Waters, one so well kept among those who have visited it that it’s difficult to mention in this blog. We know you’ll love it as much as we do, so we’ll let you in on the secret! If you’re heading south from Kekekabic Lake, make your way towards the bottleneck of land on the south end of Wisini. You’ll see a rock-step about 20 feet high. There is a campsite on top of these rocks with more than enough room for a couple of tents. We highly recommend a night or two up there, there’s nothing like a Boundary Waters sunsets perched above Wisini Lake. You’ll have to work a bit to get your gear up there, but it is more than worth it! This is a great lake to enjoy a bit of silence on. You’ll probably see others passing through, but few stay as Wisini is in-between Kekekabic and Fraser. If you bring a hammock, you’re certain to get a nice snooze in as the wind whips through the trees above you. Arrive on the early side if you’re hoping to get the site, and then spend the day exploring the cliffs or fishing off the rock-steps just below the site. We’ve heard some great Bass come out of Wisini! What is your favorite Boundary Waters campsite? Over the past few years, the medical community in Minnesota has raised an unprecedented voice of concern in response to sulfide-ore copper mining, such as that proposed by PolyMet and Twin Metals. The Minnesota Medical Association, Minnesota Academy of Family Physicians, Minnesota Nurses Association, Minnesota Public Health Organization along with dozens of individual providers, and non-profit groups with ties to human health all submitted letters in response to the one Environmental Impact Statement (EIS) done for sulfide-ore copper mining in Minnesota. The consensus by all of these groups representing over 30,000 healthcare professionals in our state is that an independent Health Impact Assessment (HIA) be mandated as part of an EIS necessary for decisions regarding sulfide-ore copper mining. Let us state here that we are not writing about the taconite mining industry, which has played and continues to play an important part in Minnesota’s history, economy, and culture. Sulfide-ore copper mining is a toxic industry with a very poor track record of success. A peer-reviewed Earthworks study in 2012 showed that 100% of modern US copper mines that had operated for 5 years or more had already polluted water. Several years can pass before leaks are detected. “Modern mining technology” that has been promised to be “safe” has not proven itself successful. The World Health Organization lists the ten environmental toxins with greatest concern to human health, and sulfide-ore copper mining releases at least six of these - mercury, lead, arsenic, particulate air pollution, asbestos, and cadmium. Sulfide-ore copper mining also releases sulfates, which fuel the chemical reactions that transform mercury to its toxic form methylmercury. These toxins have known harmful effects to human health including cancer, lung disease, heart disease, and neurodevelopmental diseases (dyslexia and other learning disorders, intellectual disabilities, autism, and ADHD among them). Babies from gestation through age three are especially vulnerable due to their rapidly growing brains, which have a high affinity for these heavy metals. Not only will the water quality suffer, but so too the air. Due to releases of fine particulates, asbestos, and asbestos-like particles, sulfide-ore copper mining in the Superior National Forest (SNF) on the doorstep to the BWCA would be expected to cause degradation of the air quality in a significant portion of the Boundary Waters, potentially endangering miners, members of the community, and visitors to the area. Given these still-present concerns, it is time again to raise our voices regarding the current decisions being made in Washington DC regarding the SNF “mineral withdrawal” (note that the terminology in the current federal process is confusing – withdrawal does not refer to mineral extraction, but rather to withdrawal of parcels of federal land from mining eligibility) in the Rainy River watershed. The outcome of the current process will directly affect our state’s crown jewel, the Boundary Waters Wilderness. In short, unless protections are given to the sensitive area under study, there remains potential for a large, industrial sulfide-ore copper mining site on the banks of the Kawishiwi River at the headwaters of the BWCA. Any toxic leachate would enter the Kawishiwi River and then flow north into the heart of the BWCA and ultimately into the Rainy River and Canada. To guard against these insidious health effects, we are urging the US Forest Service to do a comprehensive and robust Environmental Assessment regarding mineral lease withdrawal in the Rainy River watershed, specifically in regard to the risks to human health. This must include modeling for “less than ideal” releases similar to that seen in other sulfide-ore copper mines rather than limiting the modeling to the “best case scenario” often promised but never accomplished. It is also imperative that this assessment include not only the potential negative effects of a sulfide-ore copper mine in this water-rich area, but also include an assessment of the economic and cultural benefits of the current region as it stands and the risks/costs of what will be lost with the development of such mining at the headwaters of the BWCA. It is our opinion that a robust EA including these components will clearly demonstrate that mineral withdrawal in the Rainy River watershed is necessary to protect the health and wellness of this sensitive and special region of our state. We travelled to Washington, DC recently and voiced our concerns about these health impacts. Now more than ever, we need concerned Minnesotans to raise their voices, and we ask you to join us. Please go to the following website https://www.fs.usda.gov/project/?project=50938 and submit a comment under “Comment/Object on Project”. The Boundary Waters continues to face the increasing risk of permanent damage from sulfide-ore copper mining. 2018 may be the defining year for Minnesota’s canoe country wilderness. As a Minnesotan, veteran, sportsman, father and frequent visitor to the Boundary Waters, I call on the citizens of our great state and nation to make your voices heard in 2018 to protect this national treasure. Now is the time to take action. On December 22nd, the Department of Interior reversed its decades-old policy regarding mineral leases in a move toward reinstating two expired mineral leases on national forest lands next to the Boundary Waters, leases formerly held by the giant Chilean mining conglomerate Antofagasta and its subsidiary Twin Metals. This decision clears the way to reconsider renewing these leases. Going even further, on January 26th, the U.S. Forest Service announced it is downgrading the current and on-going two-year comprehensive Environmental Impact Study; reversing its decision in favor of conducting a much less rigorous Environmental Assessment. The Trump Administration is on a continuous drum beat to reverse the Boundary Waters into environmental and economic oblivion. Our national treasures demand the most rigorous of science-based analysis when considering the environmental and economic damage posed by sulfide-ore copper mining. We should demand nothing less. The Superior National Forest (which includes the Boundary Waters Canoe Area Wilderness) was established by President Theodore Roosevelt over a century ago to ensure the canoe country was passed down to future generations unharmed. He was an avid sportsman (founding the Boone & Crockett Club), decorated veteran (leading the Rough Riders and being awarded the Medal of Honor) and a proud father regularly bringing his own children into the wilderness to build character. He also saw the value and importance of these public lands to our country’s distinct and unique character. The Boundary Waters has been exceptionally formative to my own family. Living for days in the wilderness and arduously portaging from lake to lake not only gives one an appreciation for nature, but builds the grit, perseverance, teamwork, empathy, and “can-do-spirit” that helps to build our youth into strong citizens and future leaders, whether in the military, public service, or the private sector. As such, it has become a cornerstone of high adventure leadership development programs for organizations such as the Boy Scouts of America and Outward Bound. Quite simply, protecting the Boundary Waters is not only a matter of conservation; it can also have an impact on national security and the vibrancy of our country. Protecting the Boundary Waters has broad based bipartisan support across our country. Within Minnesota, Governor Dayton and a bipartisan group of representatives from the state’s Congressional delegation have spoken on behalf of Boundary Waters protection from sulfide-ore copper mining. Across America, support is coming from, among others, 204 bipartisan U.S. House Members who recently voted against Congressman Emmer’s anti-Boundary Waters bill (H.R. 3905) as well as over 285 business owners who advocate protecting the existing infrastructure and economic engine of the Boundary Waters. However, even with this broad-based support, the Boundary Waters continues to be under regular attack. As a result of the Trump Administration reversals, our Superior National Forest lands could be turned over to a private foreign entity (in near perpetuity), contradicting the will of a large majority of Minnesotans. If this happens, and sulfide-ore copper mining begins, it could very well be the defining moment when we lost the glory of the Boundary Waters to history. It is not too late to save the Boundary Waters. As we move into 2018 and the upcoming election campaign cycle, it is imperative we speak loudly to ensure that candidates for public office, regardless of party affiliation, elevate conservation of the Boundary Waters and our other national treasures as a priority. Candidates should support existing bedrock conservation laws and principles, which have served our country very well over the last century. It is also imperative we continue to let the Trump Administration know we disagree with these reversals and support a two-year Environmental Impact Study to determine the comprehensive damage sulfide-ore copper mining will inflict in the Boundary Waters. As a Minnesotan, veteran, sportsman, and father, I don’t ever want to be in a position where I have to tell my future children’s children what it was once like to have a clean, pristine and accessible Boundary Waters adventure. I would rather take them there to experience the transformative effect for themselves. This can be our legacy to the next generation, but it will only occur it we collectively stand up and take action now. Take action today: Sign the petition to protect the Boundary Waters. Joe Banavige has over 20 years of experience as a business leader, Army officer (Desert Storm), State Department diplomat (Iraq surge), DOD civilian (Afghanistan surge) and is a volunteer with the Campaign to Save the Boundary Waters. The views expressed in this article are those of the author and do not reflect the official policy or position of the Department of the Army, DOD or the US Government.